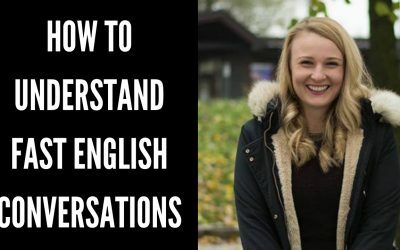 Are you struggling to understand fast English conversations? Maybe you have been watching a movie or a tv show, or simply you have been out with friends and you are struggling to understand the English conversations. In this video lesson, we will go through advanced English listening tips to help you better understand fast English conversations. Below you will find some Advanced English Listening Tips mentioned in the video lesson to help you better understand fast English conversations. The more consistent you are with listening to natural English conversations, the better and faster you will improve your ability to better understand fast English conversations. You should be making it a habit to get at least 15-20 minutes of English listening practice every single day, to see drastic improvements in your understanding in the short term. Now that you understand that you need to be consistent with your listening, you need to find some resources to listen to. Before you even think of finding an audio, think about your hobbies. 2. What are your professional interests? Think about these two questions and write down your answers on a piece of paper. Once you have clearly defined your interests, only then is it time to find something to listen to. Search for podcasts, TV shows, documentaries, movies based on your interests and start listening to these resources on a daily basis. you need to find a topic that INTERESTS YOU! Not your friends, not your neighbors, not your family… something that interests you. Mary loves cooking, she has decided to watch cooking TV shows. Carefully answer the questions in point two, so that you do find something to listen to that you genuinely love. How I pronounce words differs to that how those in America, the UK, New Zealand, and even other parts of Australia speak. It is important to listen to different accents, as English is spoken in many different countries, and we all speak with different accents. It’s important to expose yourself to different accents. I don’t have no word for you, your quite brilliant teacher I love your teaching.